What starts out empty, and by the time it is full, raises a lot of money for TAS activities? If you guessed the Football Squares board, you would be right. As of the last report, the board was over three-quarters full. If you have been putting off buying your football square, it is time to do it before the board is completely full. Once it is full, we’re not opening a second board. $50 is all that is required for an individual to purchase a square, and you could quite possibly win that back. Each week during the Monday Night Football season, prizes will be awarded for those squares matching the scores at the quarter, half, three-quarter, and final marks (based on the last digit of the total score, and the randomized numbers along the top and side of the grid – no skill involved). Not only can you win, but the congregation wins as well. If the board is fully subscribed, $5000 is raised, and $2000 is paid out in prizes, leaving $3000 to be allocated to specific temple activities. There is only one way to ensure you get a square: visit http://squares.tasnorthridge-motas.org/ to learn how to purchase your square today. There you can find an online sign-up form, or a form you can fill in, print, and mail. The Annual MoTAS Golf Tournament is on Monday, October 27, 2014, and (as I’ve mentioned before) you’re going to be seeing weekly reminders until then to participate. Each week, we’ll try to highlight the different ways you can help the Golf Tournament; this week, we’re talking about donations. There are lots of ways to help the Golf Tournament. You can buy a golf sponsorship — this gets you advertising at the event as well as advertising in the calendar/ad book (and, at the corporate level and above, player entries). You can simply buy an ad in the ad book — ranging from an $18 three-line supporting message to a $250 full page ad (these are great to solicit from the community). You can enter as a player. You can also donate items to the Golf Tournament. You’re probably wondering how donations help the tournament. They help in two ways. First, some prizes are used for raffles and special contest prizes. We’ll be starting to advertise some of those prizes over the coming weeks on the Golf 2014 web page (http://golf2014.tasnorthridge-motas.org/) to encourage people to sign up as players. Second, prizes are used as items in our silent auction — restaurant certificates and donations of services are especially good here. All of those donating items will receive recognition in the event program and tournament website as well as all event publicity, and a tax deduction where allowable by law. This is an excellent advertising opportunity and a forum to express your support of local community functions. Your contribution identifies you as a supporter of Temple Ahavat Shalom and its programs, and our congregants will want to support those who support us. How do you get these donations? It all starts with at the Golf Tournament webpage: http://golf2014.tasnorthridge-motas.org/. There you will find the donation form, as well as both a printable registration/sponsorship form and an online registration sponsorship form. You can donate or sponsor yourself, or you can get the community involved. I encourage you to do the latter — it builds our relationship with the community. All it takes is you, talking about the golf tournament with your favorite local businesses. Remember, all money raised by the Golf Tournament and ad book, after expenses, goes directly to supporting MoTAS, to MoTAS supporting TAS in all of its needs, and in supporting a number of charities, such as the Knock Foundation, with which MoTAS works. By supporting the adbook and Golf Tournament, you support TAS. As always, you can find more information on the golf tournament and the calendar/ad book at http://golf2014.tasnorthridge-motas.org/. Our Golf website provides information on how register as a player, how to support the calendar/ad book, and how to get special golf sponsorships. Where were you last Friday night? Approximately 180 of you were at Temple Ahavat Shalom, celebrating our second Shabbabeque of the summer. The evening was perfect, the service was great, and the food was delicious. Thank you to all of our volunteers: Scott, Alia & Coby Yollis, Lee Baum, Bob Hyam, Frank & Alec Soronow, Fabian & Jennifer Malinovitz, Daniel Faigin, Joel Lowell, Shelly Spector, Mackenzie Graham, Bob Levine, Bob Brostoff, Bill Shapiro, Mike Thornhill, Steven & Jacob Zonis, Roger Lowe, Brian Reback, Ben Tenn, Dave Friedman, and Rick Mervis. Kathy Pullman staffed the Football Squares table. A special extra “thank you” goes to Joel Lowell who coordinated the purchasing and volunteers, and Steve Zonis, who personally trimmed and marinated all the chicken and coordinated all of the cooking. Additionally, thank you to the members of the TAS Sisterhood for their hard work setting up the Oneg, and for dealing with all of the people invading their kitchen space. The first day of Religious School is approaching fast… and you know what that means. It’s time for the MoTAS Pancake Breakfast. Join the men of Temple Ahavat Shalom on Sunday September 7 at 9am for a delicious breakfast of pancakes, juice, and other goodies. The cost is low — $5 for pancakes, $1 for juice/coffee only, and free for teachers and new school families enrolling their first child in the school. The morning provides you the opportunity to learn about the different ways to get involved with TAS and strengthen that relationship. As parents, we are the role models for our children. If we get involved with the synagogue, we’re demonstrating to our children the value of involvement. If you would like to volunteer to help at the Pancake Breakfast, please contact Joel Lowell at 818/832-1525 or email jlowell@socal.rr.com. You can also fill out the contact form at www.tasnorthridge-motas.org. Sunday, September 14th marks the start of our monthly speaker program. Join the Men of TAS at 8:45 AM in Activity Center 5/6 for a scrumptious breakfast typically consisting of bagels, lox, eggs, cookies, fruit, juice, and coffee/tea (donations appreciated). Our normal monthly meeting (d’var torah, introductions, and a review of upcoming activities), starts at 9:00 8:45 AM (meeting starts at 9, but food starts earlier), followed by our speaker at 10:00 AM. This month, our topic is “Jewish Institutions of the Sepulveda Pass“. The Jewish institutions that line the Sepulveda Pass offer physical evidence of LA Jewry’s westward movement and a glimpse into the beliefs and ideals that helped shape American Jewish observance and culture over the past fifty years. Dr. Erik Greenberg, Director of Education at the Autry National Center and participant in the UCLA Center for Jewish Studies’ web project, Mapping Jewish LA, will explore and explain the connections between the Jewish institutions of the Pass and their connection to some of the most significant developments in postwar American Jewish thought. Erik Greenberg received his Ph.D. in history from the University of California, Los Angeles and also holds MAs in history from UCLA and California State University, Northridge. Erik has spent over a decade teaching a range of students from k-college and beyond a wide variety of historical subjects ranging from the history of the American West to the intellectual and cultural history of the American Jewish experience. Erik is a frequent contributor to a number of academic journals as well as the Autry’s quarterly magazine, Convergence. He has been the recipient of numerous awards and honors, including the American Jewish Archives’ Lowenstein-Wiener Research Fellowship and two Monkarsh Family Fellowships at UCLA’s Department of History. Erik has lived in Los Angeles for twenty-two years, and has spent a considerable amount of time stuck in traffic in the Sepulveda Pass. Future speakers include our executive director, Aaron Solomon, on how the temple runs; Dr. Allan Katcher on managing your strengths, and a Judaica show-and-tell. Full information on the speakers program may be found at http://www.tasnorthridge-motas.org/activities/monthly-meetings/speakers-program/. The best way to build a relationship with someone is to get to know them. In support of this, we’re using our weekly newsletter to introduce you to the Men of TAS, starting with this year’s officers. If you’re a man of TAS — especially if you’re a regular participant in MoTAS activities — we would love to share your bio. Just mail it to president@tasnorthridge-motas.org. Rick Mervis, secretary of MoTAS, has been a member of Temple Ahavat Shalom since 2000 and has had the honor and pleasure of seeing his son’s and daughter’s B’nai Mitzvah in August 2013. Rick has been in the motion picture industry for over 30 years in Marketing, Advertising and Technical Training. Rick’s hobbies are hiking, camping, photography, music and golf. He joined MoTAS to give back to his Jewish heritage and fellow congregants in ways he hopes will make a positive impact, and that will inspire others to preserve our Earth and promote the best of Judaism. The Executive Board of MoTAS meetings monthly via teleconference. The minutes of the Executive Board meetings are public, and posted at http://www.tasnorthridge-motas.org/resources/motas-administration/. Comments and questions on the minutes are welcome; if a member of MoTAS wants to review any background from the meeting, simply contact the MoTAS President at president@tasnorthridge-motas.org. At the August Executive Board meeting, the Board reviewed the nearly final budget and discussed the process for approval, given the goal to streamline the Sunday morning meetings. The plan is to announce the final availability of the budget at the September meeting, and provide an online pointer to the budget in the MoTAS Weekly. Hardcopies will be provided upon request to those unable to access the electronic version. Questions will be entertained electronically during September, and any adjustments will be made at the October Executive Board teleconference. The resulting budget will be submitted to the membership for a simple up or down vote at the October Monthly Meeting. Also reviewed during the August Executive Board meeting was the status of recent and upcoming activities, a request for a donation from the Knock Foundation, and final approval of our congregational support policy. As always, remember that the Men of Temple Ahavat Shalom is *your* organization. 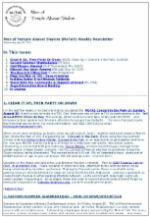 Keep up to date on our activities at http://www.tasnorthridge-motas.org/ and participate. We want to serve all the men of Temple Ahavat Shalom and welcome new participants from the TAS membership. Join our Facebook group and “follow” our new website. Come be part of the Men of Temple Ahavat Shalom!